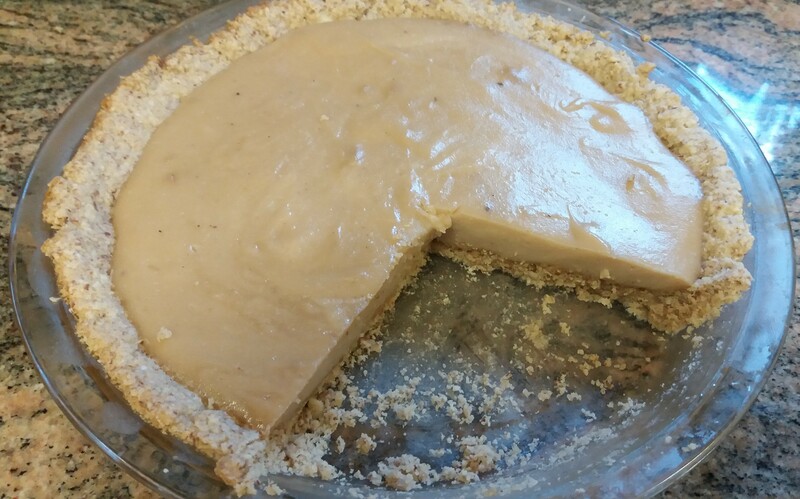 This is a quick and easy no-bake pie and is a go-to when you have a craving for that lemon sweet flavor. Place the pecans, dates and pinch of salt in a food processor and process until it forms a sticky dough. It will start off crumbly and that is okay. Keep processing until it starts to clump together in sticky clumps. 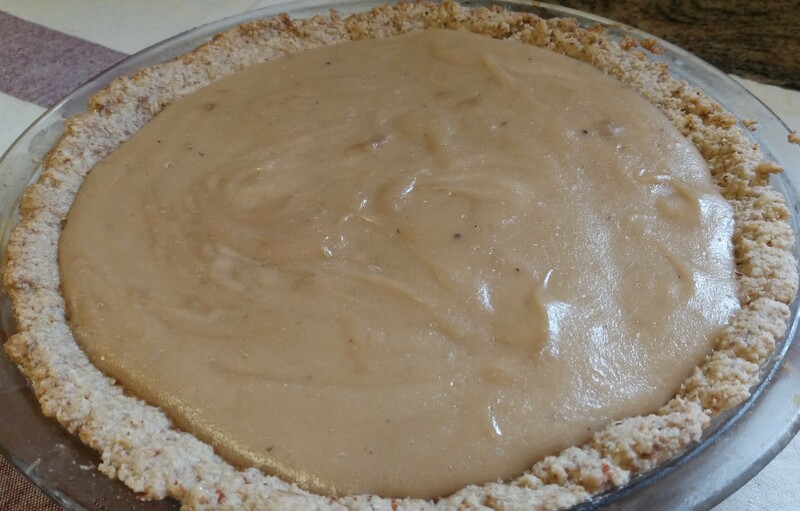 Transfer to a 9″ glass pie dish and press the crust into shape. Use the back of a spoon to press it into a nice flat layer. Note: If you prefer, feel free to use the very quick and easy gluten-free crust that tastes delicious and is my go-to version . Place the ¼ cup water and agar flakes in a small pot and let it soak for 10 minutes. While constantly stirring, bring to a boil on medium heat and cook until the flakes dissolve. The texture should be a thick syrup. Place the drained cashews and ¾ cup water in a blender and process to make a no-lump cashew milk. Process until smooth. Pour this cashew milk into a pot and add rice syrup, maple syrup and sea salt. Warm on medium flame ensuring to constantly stir, using a rubber spatula as the mixture will thicken from the bottom. Be careful not to burn. Pour the water/agar flake mixture into the cashew cream pot and mix well. Add the lemon juice, mix thoroughly and turn off the flame. Pour this mixture into the pie crust. Allow to cool as it will thicken as it reduces in temperature. Enjoy!